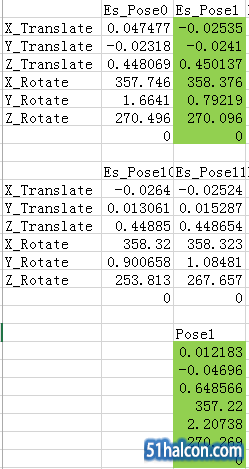 Estimation for the external camera parameters. Roughly estimated pose of the observed calibration object relative to the observing camera. These parameters describe the characteristics of the used camera, especially the dimension of the sensor itself and the projection properties of the used combination of lens, camera, and frame grabber. These 6 parameters describe the 3D pose, i.e., the position and orientation, of the world coordinate system relative to the camera coordinate system. For line scan cameras, the pose of the world coordinate system refers to the camera coordinate system of the first image line. 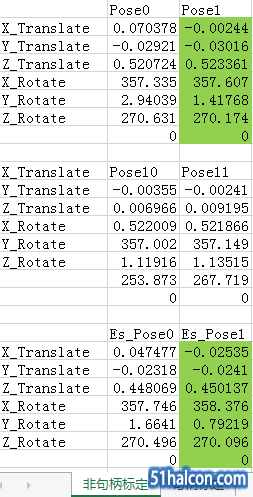 Three parameters describe the translation, three the rotation. See create_pose for more information about 3D poses. Note that camera_calibration operates with all types of 3D poses for NStartPose. When using the standard calibration plate, the world coordinate system is defined by the coordinate system of the calibration plate which is located in the middle of the surface of the calibration plate, its z-axis pointing into the calibration plate, its x-axis to the right, and it y-axis downwards. 申请友链|小黑屋|手机版|Archiver| GMT+8, 2019-4-24 16:31 , Processed in 0.089571 second(s), 40 queries , Redis On.